John Edwards, Karan Saraf, and I walking Jesup Path in Acadia National Park, Maine on May 16, 2018, 21:50. This is a quick panorama from the light of our headlamps. Camera settings: 70mm, f/7.1, ISO 3200, 2 seconds. Stitching data: 3 rows of 3 images and cropped to 2x3 ratio, 212 megapixels. Equipment used: Nikon D850, Nikon 70-200mm f/2.8, Really Right Stuff TVC-34L tripod & pano/gimbal head, and Nodal Ninja RD16-II rotator. RAW conversion via Lightroom, aligned with PTGui, and blended in Photoshop. Chris Lawrence of Maine Photography shooting a winter sunset at Duck Brook in Acadia National Park, Maine, March 17, 2018, 17:07. This panorama is 9ft x 3ft. 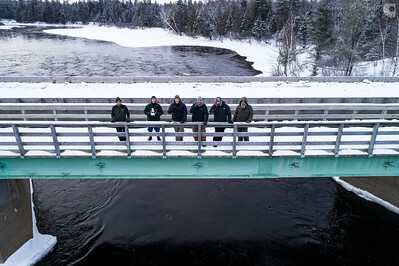 Chris Lawrence of Maine Photography shooting a northern Maine winter landscape on Abol Stream. Colin Chase and Garrett Evans shoot some ice formations on River Pond along the Golden Road at sunset, February 24, 2018, 17:39. 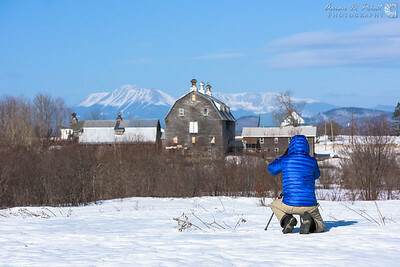 Handheld panorama of Chris Lawrence capturing a traditional New England winter scene. 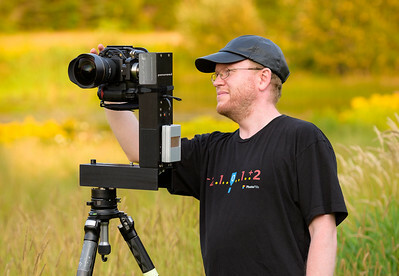 Chris Lawrence lining up a scene of Summit Farm against Mt. Katahdin as a backdrop. 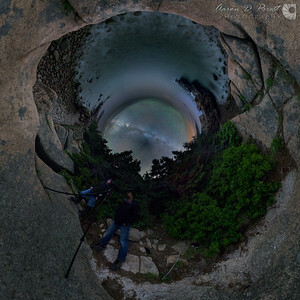 A good friend of mine, Matthew Parks, composes a shot of the moon at Thunder Hole in Acadia National Park on July 19, 2014, 2:33 AM. The galactic core of the Milky Way had set a few minutes before, and a 48% moon was about 28° above the horizon illuminating the foreground. Camera settings: 14mm, f/2.8, ISO 1600, 25 seconds for the stars and 100 seconds for the ground. 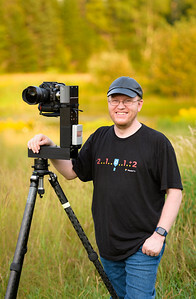 Equipment used: Nikon D700, Nikon 14-24mm f/2.8, Promote Control, and Really Right Stuff TVC-34L tripod & ballhead. Dark frame subtraction via Pixel Fixer, RAW conversion in Lightroom, and exposure blended with Photoshop. 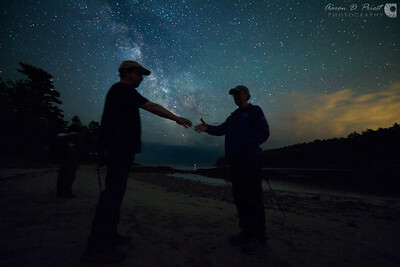 I bumped into my good friend, Mike Taylor, teaching one of his one-on-one workshops in Acadia National Park. We hung out until sunrise shooting a few places around the park. This is Beehive Lagoon during astronomical dawn on June 17, 2015 at 3:12 AM. Camera settings: 14mm, f/2.8, ISO 5000, 20 seconds. Equipment used: Nikon D810, Nikon 14-24mm f/2.8, Promote Control, Really Right Stuff TVC-34L tripod w/ leveling base & panorama/gimbal head. Long exposure noise reduction via Pixel Fixer, RAW conversion in Lightroom, and planned with PhotoPills. 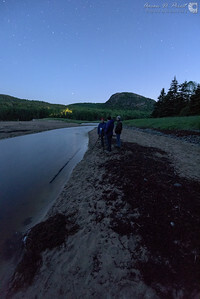 Venkat Pakala and I shot this shortly before and during astronomical dawn on June 18, 2015, 01:27 – 02:53 AM from the cliffs of Ocean Path along the Park Loop Road in Acadia National Park, Maine. 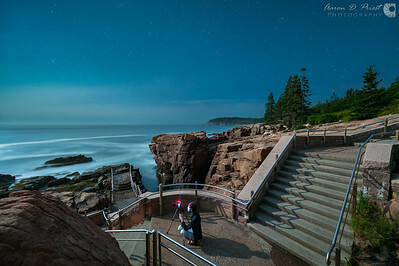 The outcrop into the ocean on the right is Thunder Hole in the foreground with Otter Cliff far off on the horizon directly below the galactic center of the Milky Way. On the left are the cliffs overlooking Sand Beach with Great Head on the horizon beyond, and dawn fast approaching. High tide was at 12:23 AM. A little bit of air glow is visible over the ocean’s haze. I shot two spheres of two different exposures and blended them in Photoshop, the shorter exposures of the sky first followed by the long exposures of the ground as it got brighter out. All of the photos were aligned in a single PTGui project since there was some discrepancy between the alignment of the two spheres, having shot them on a manual panning head without the accuracy of a robotic panning head or a click-stop rotator, and rushing to beat sunrise! I manually blended and masked all the individual photos and exposures in Photoshop. Each sphere consists of 2 rows of 6 photos, plus an extra shot of Venkat and I attempting to stand still! 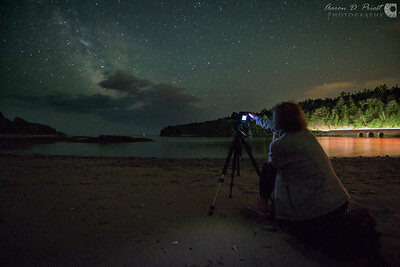 Camera settings: 14mm, f/2.8, ISO 5000, 20 seconds for the sky and 14mm, f/2.8, ISO 5000, 158 seconds for the ground. 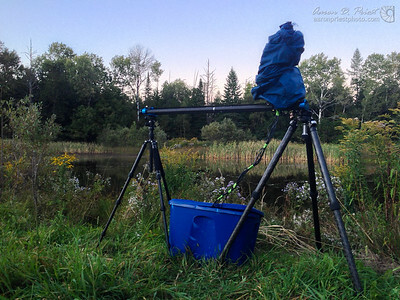 Equipment used: Nikon D810, Nikon 14-24mm f/2.8, Promote Control, and Really Right Stuff TVC-34L tripod w/ leveling base & multi-row panning head. Long exposure noise reduction via Pixel Fixer, RAW conversion via Lightroom, aligned via PTGui, and manually blended via masks in Photoshop. Planned with PhotoPills. 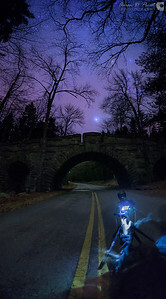 James Flachsbart shoots Orion and Sirius over Stanley Brook Bridge in Acadia National Park on December 15, 2015, 11:38 PM. Stanley Brook Road was closed for the winter, so we had no traffic to be concerned about. 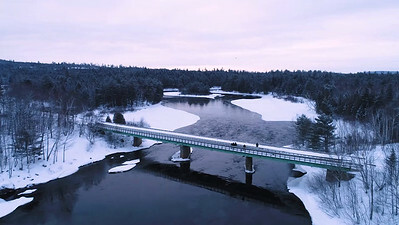 This “vertorama” is stitched from two portrait images with PTGui, plus a long exposure of the road and bridge masked over it in Photoshop. I brought all the images into PTGui and used the “Link” feature under Image Parameters and saved the image out of PTGui as a .PSB file with “individual layers only” so the bottom images would have the same alignment in Photoshop for masking and blending. 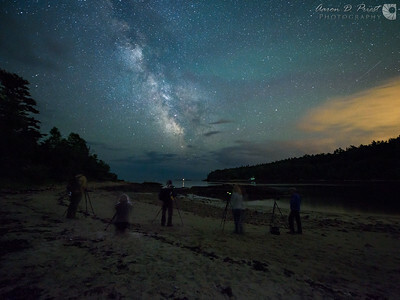 Learn about this and more at our upcoming Night Sky Panoramas workshop in May: http://galleries.aaronpriestphoto.com/Workshops/2016MayPanoramaWorkshop Camera settings: 14mm, f/2.8, ISO 6400, 25 seconds x 2 images for the sky and 14mm, f/2.8, ISO 3200, 240 seconds for the ground. Equipment used: Nikon D810, Nikon 14-24mm f/2.8, Promote Control, and Really Right Stuff TVC-34L tripod w/ leveling base & multi-row panning head. Long exposure noise reduction via Pixel Fixer. RAW conversion via Lightroom. Nikon D700 & 14-24mm f/2.8 all wrapped up for an overnight timelapse on an eMotimo TB3 Black & Dynamic Perception Stage Zero slider. 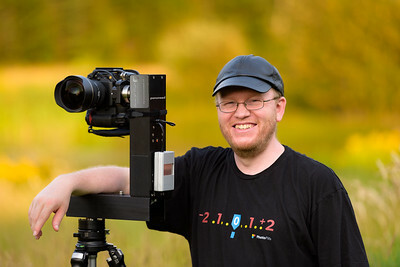 Really Right Stuff TVC-34L tripod on the right and MeFOTO RoadTrip tripod on the left. In the bucket is a Goal Zero Sherpa 100 battery, Ramper Pro, and DewBuster controller. The cables are power to the camera, eMotimo, & DewNot heat strip around the lens, shutter, USB, & bulb cables to the camera, trigger cable to the eMotimo, light sensor for the Ramper Pro, and temp sensor for the DewBuster.